The Home tab is a centralized place for accessing all maps you have access to. 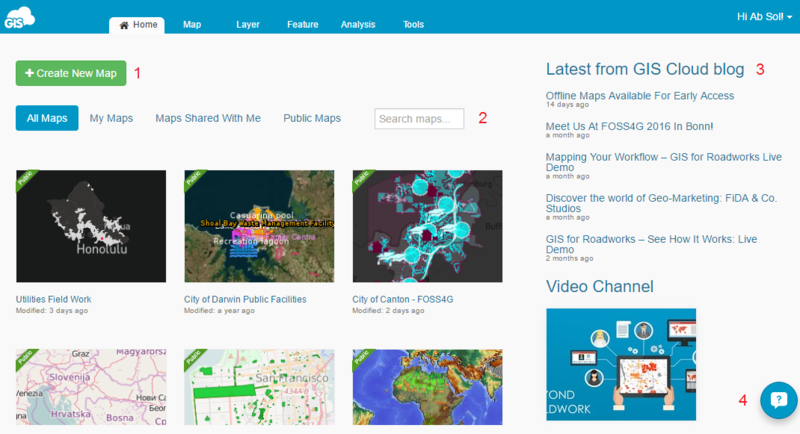 Here you can create new maps (1) and access to all of the maps available to your user account, whether the maps are created by you, shared with you or publicly visible (2). The menu on the right (3) provides you access to all GIS Cloud blog and video news. If you need immediate help with GIS Cloud, you can reach us directly and our operators will help you on the spot (4).